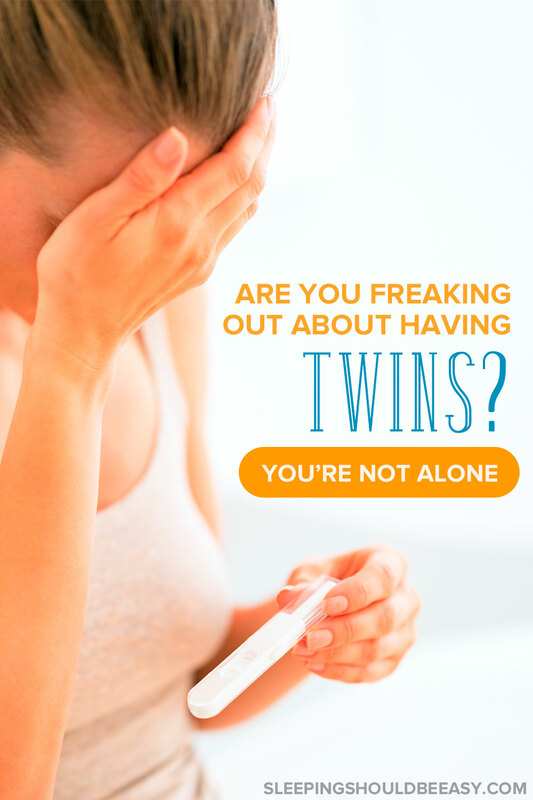 Are you having twins and scared about it? Here’s one mom’s honest post about hearing the news of having twins and how to overcome the fear. Two newborns. Two newborns who will not sleep through the night. Two toddlers who will have separation anxiety, bath time fears, determined defiance, and tantrums. My doctor was happy as she congratulated me on the surprising news. Meanwhile, I plastered on a fake smile because deep down, the news scared me out of my mind. I was watching the monitor as my doctor performed the sonogram. “Well, I have good news…” she began, “…and even better news.”And right away, I saw the two blobs on the screen. I knew before she even uttered the T-word that I was carrying two babies. For the most part I’m right. Any parent of twins will tell you that it’s a boatload more work than a singleton. I approached a father of a brother-and-sister twin set at the park and said, “Wow, you must have double the work of a single child.” And he responded, “Not double—quadruple!” I believed him instantly. And did I mention that I already have a toddler? I would have been more okay if my first pregnancy resulted in twins. Great—two kids is a good amount—now we can get it done in one swipe. But nope, now we get to have the fun with twins while raising a toddler as well. Cue me freaking out about having twins during pregnancy. 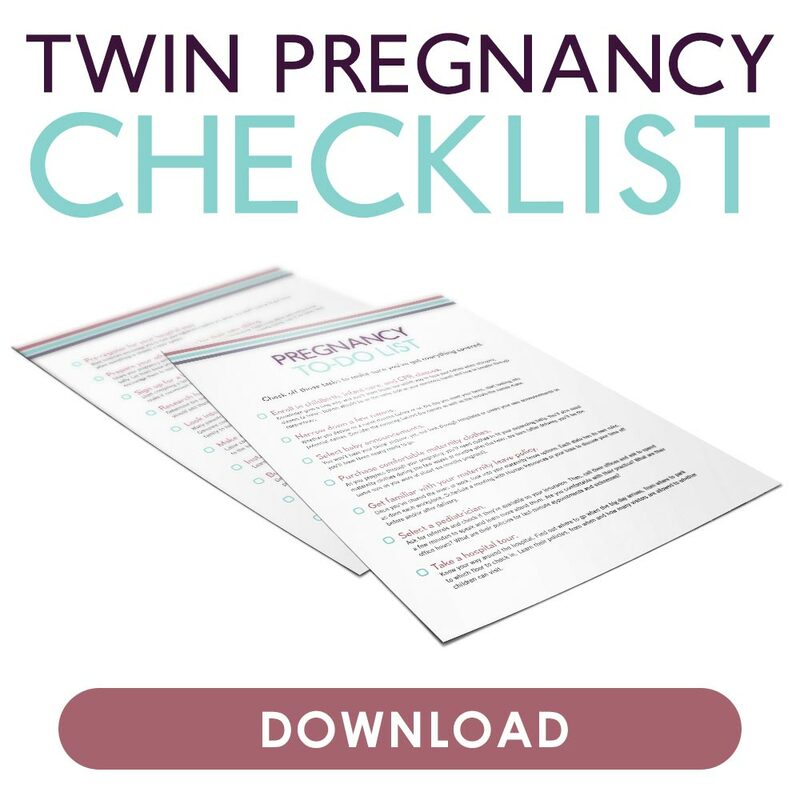 Having twins and scared about it? I need to check in with my doctor a whole lot more. I’m more likely to develop complications such as preeclampsia and gestational diabetes. I’m going to feel fatigued. I could already feel a difference now at seven weeks with twins compared to seven weeks with my first. The babies are at higher risk for being born prematurely, bringing on a slew of complications on its own. I need to rest a whole lot more than my previous pregnancy. Maybe the biggest challenge I’m trying to absorb is that this goes against my plans. Yes, I plan, even with something as unpredictable as children. When my husband and I tried to conceive again, I was aiming for two and done. I wanted another sibling for my little guy to be a big brother to. Now we’re a family of five. Um, hello world—that’s not what I planned for (insert fist shaking at the sky)! I’m also worried about my toddler—how will he react? Will he feel excluded? I was already leafing through advice on how to introduce a new baby to your child. Will it be worse with two babies? When I picked him up today, I couldn’t help but shake my head and think, “You have no idea what’s in store for you.” I wanted to protect him from the vast changes about to happen to him, changes he didn’t ask for. So yes, I’m freaking out about having twins. I know others have done it before. My good friend is a twin herself, and she and her sister share a special bond that only twins will share. Heck, my little guy might even prove me wrong and be the most compliant toddler. The best big-brother helper in the world, despite two crying babies. And for all I know, this second pregnancy may go just as smooth and complication-free as my first. I almost feel embarrassed and guilty admitting how I feel. With the doctor and nurses saying congrats, I felt strange for not jumping with joy. I should be happy I’m having twins, but I’m not. Not exactly. I feel scared. And I know how ungrateful I sound, considering many families are trying to conceive even just one. And here I am complaining about carrying two. Still, these are my honest, initial emotions, and I won’t lie. Much has transpired with my fears and anxiety from seven weeks up to the point that you’re reading this now. I wanted to capture my emotions and prove myself wrong. That I’m able to do this, that this is a blessing, and learn that double the trouble also means double the love. And double the family memories. And double the lessons I’m bound to learn from these two babies, these twins of mine. Update: The twins are now four-years-old and I cannot be happier to have them in my life. The first few months were rough, but having had a first child, I knew the challenges were temporary. My life is like the normal we had before the twins were born. When Does Caring for Twins Get Easier? How did you react to the news of your pregnancy? What are your biggest fears and worries about carrying twins? Let me know in the comments! You should not be embarrassed! I would totally be freaking out too! But you are an amazing mom and you can totally do this! Good news is you’ve already had lots of practice! I know this probably doesn’t help you but…you already help so many women with your blog, now you are going to be able to help so many other women with twins! Just take one day at a time. I would be freaking out, too. But it occurs to me that if anyone can do it, you can. You have so much natural wisdom when it comes to parenting. My mother-in-law, who had 8, says it takes about three months for an older sibling to adjust to a new baby (or babies). I found that to be the case with my three, too. Just FYI. It’s completely understandable that you were scared at first. Heck, I’m scared about adding just one more, I can’t even imagine twins. But, I am convinced that you can handle it and that you will love it. There are certain advantages that twins have. They often sleep better because they have each other. And they’ll always have each other to play with. And your toddler will be a great big brother, he’s just going to need some extra attention for a while, so you’ll need some extra help in the beginning. But you both have big families and friends, so it will all be fine. The reasons you gave are just some of the convincing that’s taken place in my mind 🙂 I think in general it’ll be harder than with just one, but I definitely see the positive aspects like you mentioned—they tend to be better sleepers, are easily entertained, etc. At least that’s what I tell myself! Wow Congratulations Nina!! I’m sure these are very natural feelings. I am pretty sure I would be freaking out too! Our second baby was a surprise pregnancy and I remember feeling scared for my first baby (who was only 11 months old when we found out I was pregnant!). 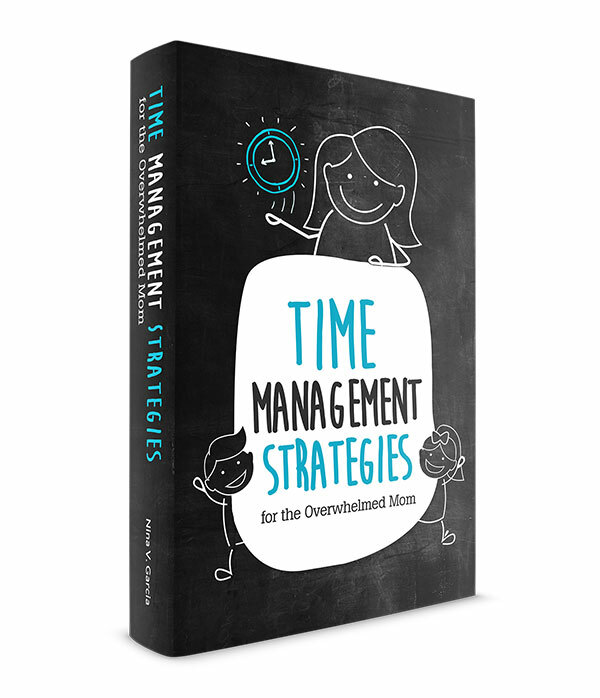 I worried about missing time with him and him feeling less special. Turns out, he LOVES his baby sister! I am sooo touched every day because he has shown us how tender hearted he can be and what a good big brother he is. When she cries, he is often the first to jump up and go to her aid, finding a passy or rubbing his blankie on her cheek. You will see a side of your LO you didn’t know existed! You will be a wonderful mommy too!!! Thank you, Kim! And thanks for chiming in with your experience with two kids. So far our LO has been excited about the idea of babies, although I’m not sure if he even “gets it.” Still, it’s so sweet to see him patting and kissing my belly because that’s where the babies are, and I tell him that that makes them smile and feel good. I’m hoping that he will adjust and find a new role he can be proud of! OMG What did I miss??? Firstly a big CONGRATULATIONS! My best friend has twin infants and my sister-in-law has twin toddlers, and they both admit it’s been hard but they are managing really well. I think it’s such a blessing and special relationship that twins have and it makes me (almost) jealous seeing how they interact with each other! Thanks Sass! I’ve totally been on “list mode” trying to focus on practicalities. Sometimes it’s overwhelming, like when I think about how the heck we’re going to afford a preschool for a toddler and child care for two infants. !!! Still, I’m sure there will be days when I’ll wonder how I ever got by without them. Thanks so much for your encouraging words; they really mean a lot to me. And as far as sleep… I will try to learn from my “mistakes” and see where they take me. I’ll try not resort to rocking them to sleep this time around! I’ll also have them on a schedule instead of “feed on demand,” which I heard is important for twins, otherwise you’re just feeding round the clock and will never get any rest. But yes, I am going to be a hawk over their sleep and hopefully they’ll establish good habits early on! Thinking of you, Nina. I can imagine your frustrations. Totally normal and understandable. Thanks, Kerry. There are still days when I freak out (like last night), thinking about how we’ll afford child care, what kind of scheduling arrangements do we have to do, who can or will help us out, etc. And I just try to focus on having a healthy pregnancy. Stress doesn’t do much good for pregnancies! Still it’s hard, but thankfully it comes and goes. I just have to be mindful to let it go. Congratulations from a triplet mom! It’s entirely normal to freak out, and continue to freak out! What will surprise you is your own personal growth (not actual weight growth :-)) throughout the process. I remember when I found out I had the same reaction. I especially understand about making new plans. Everything I thought about my future, career, finances, home had to be erased and a new plan had to be created. You and your husband will become resilient and find ways to make it work. My kids are 3 now and it’s been quite a crazy ride but also a privilege! Congrats again! I’m so glad I came across this article – I found out 2 days ago I’m expecting twins and I can 100% relate to what you were feeling when you wrote this. We have a 2 year old and were planning on ONE more baby, and then we find out its twins….im in complete shock. Here we thought we had almost everything we needed for a baby but no now we have to buy everything all over again! And it scares the crap out of me to think of how we will handle two babies when we also have a crazy toddler to care for! I’m terrified and have no idea how we are going to handle this, I want to cry every time I think about it. I would love any advice or tips you can give! Hi Jennifer! Yup, I was in the same boat. I’d go from excited to scared to mad to crying and all those emotions. I worried about how my body would handle twins, how we’d afford it, how to take care of two PLUS an older one. You’re definitely not alone! As far as general advice, I have a whole section of twins on my blog where I get into more detail about it: https://sleepingshouldbeeasy.com/category/twins/ I suggest starting there. I also went on Baby Center’s twin moms group, though I’m sure there are other forums and twin mom groups out there as well. It was comforting to know that I wasn’t alone, that other people understood the twin lingo and all the challenges and joys of having twins (because singleton parents can only relate so much). Congrats, and truly, welcome to the world of twins. Mine are now two-years-old and there are times it’s super hard, but it has made me stronger and I love having my boys. My eldest and the two are now the best of friends. I’m 22 weeks pregnant with boy/girl twins and this is exactly how I’ve been feeling! Thank you for writing this! When I found out, the ultrasound tech was all excited and I told her, “I’ll be excited next month” hehe Still not feeling excited, exactly (hoping my upcoming shower will help with that). Though I can’t wait to hold them!! I just found out 3.5 hours ago that I’m expecting twins and I’m still in shock. I have a 19 month old at home that I immediately thought about as I began to cry while the tech was still doing my ultrasound. Your website was the very first one that I stumbled across as I begin my Google journey about twins and every word you said was exactly all the thoughts that I’ve had so far. The fear, the guilt, the sadness, only wanting one more child…. every. single. word. Thank you. I know that once I settle into the reality that I’ll feel more positive about this, but your words really made me feel less terrible to know I wasn’t the only one with instant negative feelings. Best wishes to you and your family! I’m so glad you’re reassured, Katie! You’re definitely not alone 🙂 And yes, the emotions are overwhelming, and completely normal. You will get through this, mama! Twin life is a good life! And please feel free to comment or reach out if you ever have any questions.